This item will be shipped. 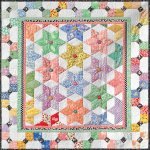 Cut precises 60 degree diamonds from Jelly Rolls or 2-1/2" strips from your stash to make gorgeous diamond quilts. Instructions are included in the template. Solid acrylic template set includes 60 degree diamond, 45 degree diamond, and 60 degree hexagon and gem templates for rotary cutting precise shapes from 2-1/2" fabric strips. Cut multiple strips at a time and get precise diamonds which go together perfectly.